HEELYS Shoes | Buy HEELYS 's Shoes - Free delivery with Spartoo NET ! At Heelys, trainers are on a roll! Launched in California in the skater community, these new generation shoes come equipped with removable wheels for a creative look. A 2 in 1 concept that rivals skates and skateboards. Get ready to ride! Welcome to California ! Created in 1999 in the United States, the brand Heelys is inspired by California skateparks. The brand's shoes give your kids the feeling of freedom and bravery and transforms every daily moment, like going to school, a moment of intense fun. You'll see, thanks to the style like their famous Dual Up, children won't dawdle any longer...they skate! These half-trainer half-rollerskate shoes feature an outsole with a small wheel. They are like normal trainers when worn, or the wheels can be used like skates. 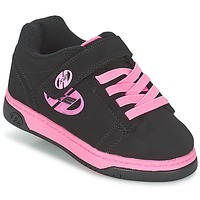 Heelys has boys shoes they will love, and girls shoes that are a little more girly. Heelys trainers: why walk when you can roll ? Give into a pair of skate trainers to go really fast! And to please everyone, your online shoe shop Spartoo UK offers shoes at very low prices during the sales and the private sales. And if you like skate style, have a look at our page of Vans shoes, and you'll certainly find what you like.